31,347 others viewed this post. We tend to think of the stars as “fixed” in the sky, and indeed they appear that way in our short life times. They are of course not only moving around and interacting with each other, but new stars are born, and old ones die. If you aren’t looking closely though, you’d never know. Some stars last a few hundred thousand years, and others billions. 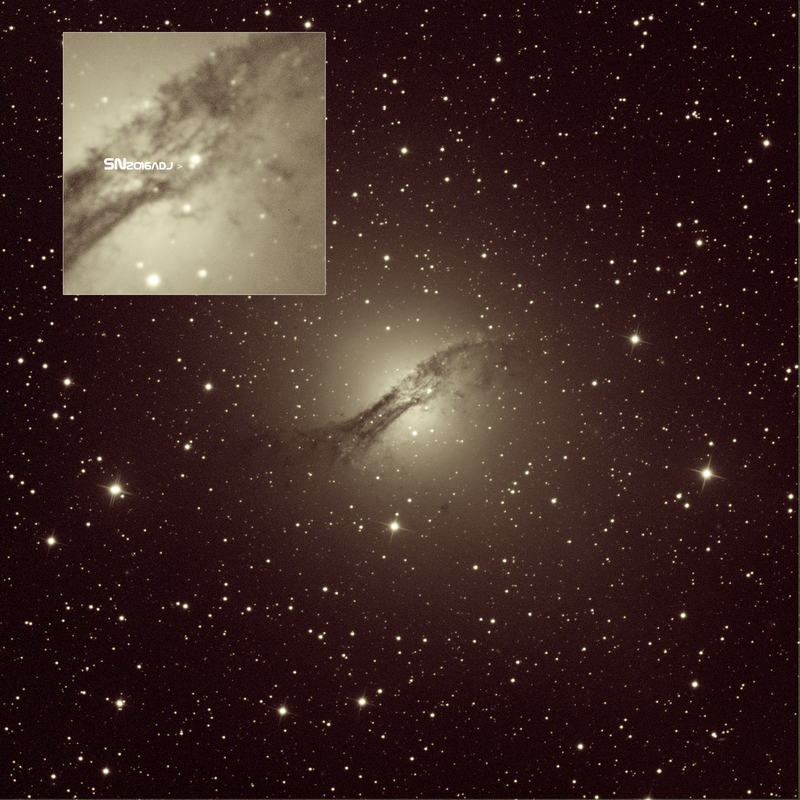 3 days ago, Peter Marples of the Backyard Observatory Supernova Search (BOSS), which are a small group of amateur astronomy friends in QLD Australia, was comparing the “control” images of the beautiful Centaurus A galaxy with one he’d taken that night. His keen eyes noticed a small protrusion at the end of one of the brighter stars. After double checking it wasn’t a camera or tracking error he and Greg Bock passed on the news to the science community. It has since been confirmed as a supernova – a dying star. When stars die, they collapse causing huge pressure waves and an outburst explosion into space. When stars explode like this, they form many of the higher and more complex elements above Iron. Things like Gold, and Titanium. Do you have some gold near you right now? It was formed when a star died, going supernova and exploding and the element made it’s way to earth somehow. Weird right? After hearing the news of this new supernova, the first in this charismatic galaxy since 1986, I decided to rent time on a powerful remote telescope to catch a glimpse. This one 3 minute exposure cost me about $20. To rent the scope for 1 hour costs $260+! It’s a beautiful scientific instrument though, and resolves the supernova quite clearly in this monochrome photo, labelled with its designation and an arrow. In the coming days this supernova will brighten with the energy of the explosion, and then dim, and disappear. Scientists globally will be watching, measuring it’s spectra and light curve and assessing old Hubble images to confirm the progenitor star for the explosion. The telescope used was a massive 0.7m diameter Planewave CDK hosted at the Siding Springs Observatory in NSW Australia. 1 x 180 seconds 1×1 binning.